First Time Home Buyer What Should I Ask For? What should I ask for in my offer to buy a house? how strong is the home Buyer’s offer? There’s an old saying in real estate when you’re negotiating. You either get the “price” or you get the “terms”. Not usually both. But sometimes you can get both. So what are inclusions and exclusions. How does negotiating work? Inclusions in an Agreement of Sale are defined as the items that the Seller wants to include with the home purchase. Could be anything from the washer, dryer to a refrigerator or other personal items. “Fixtures” are defined by Pennsylvania Law to be the items that are affixed to the property and may not be removed. Fixtures are items like the drapery rods, the stove, light fixtures, switch plate covers and all items that are nailed down or affixed to the property. Fixtures are not personal property. In other words the shower stays but not the shower curtain. Exclusions are those items defined by the Seller as items that the Seller doesn’t want to convey with the property. In our Pennsylvania Listing Agreements, Inclusions and Exclusions are identified in the Listing Agreement and displayed in the Multiple Listing or Brochures, but not always. Inclusions and Exclusions should be named in any fully executed Agreement of Sale. Now here’s where the fun begins. The truth is that it’s all negotiable IF AND ONLY IF both parties want it to be and agree IN WRITING. Every negotiation begins with an offer, then a response, etc. If everyone hears the same music, it’s a little like a good dance. Here’s a caution. After the Agreement is fully executed (signed by all) every subsequent negotiation “opens up” the agreement and potentially puts the offer at risk. 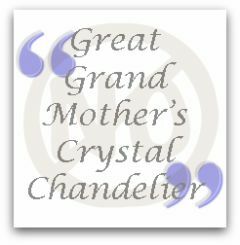 Is that your Great Grandmothers’ crystal chandelier you forgot to exclude? Sellers, help me out here. Exclude it or replace it before my Buyer sees it and falls in love. The lawyers will be disappointed. But I’ll be eternally grateful. Did I ever tell you about the time that the Buyer wouldn’t buy unless….and then the Seller… Well, maybe next time! Need a skilled negotiator for your Chester County home, Delaware County home or Montgomery County home? You came to the right place. I love to negotiate! Contact or call Judy Peterson at Prudential Fox and Roach Realtors 610-889-5509 for my best negotiating tips. This entry was posted on Friday, January 2nd, 2009 at 7:37 am	and is filed under A Realtors Life, First Time Home Buyers. You can follow any responses to this entry through the RSS 2.0 feed. You can leave a response, or trackback from your own site.